DeRiemer Adventure Kayaking specializes in providing quality white water kayak guiding and instruction for groups and individuals. Whether you are interested in private instruction, instructor training, or an adventure paddling vacation, chances are we have an offering that will fit your needs. We have both been actively involved in the development of kayak instruction and guiding for almost thirty years through teaching, writing, videos, competition, and exploration. Our small size and vast experience means we are able to maintain a high level of quality throughout all of our programs. 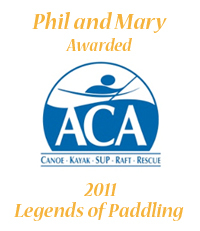 In 2011 we were awarded “Legends Of Paddling” by the American Canoe Association. A great honor, this award recognizes individuals for what the ACA calls “legendary contributions to paddlesport”. Through this blog we hope to share some of our adventures, keep you posted of changes and new offerings, give you some instructional tips, and post photos.